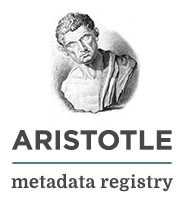 Welcome to Aristotle Metadata Registry’s documentation! Aristotle Metadata Registry is an open-source metadata registry framework as laid out by the requirements of the ISO/IEC 11179:2013 specification. Aristotle Metadata Registry represents a new way to manage and federate content built on and extending the principles of leading metadata registry. The code of Aristotle-MDR is completely open-source, building on the Django web framework and the mature model of the ISO 11179 standard, agencies can easily run their own metadata registries while also having the ability to extend the information model and tap into the permissions and roles defined in ISO 11179. By allowing organisations to run their own independent registries they are able to expose authoritative metadata and the governance processes behind its creation, and building upon known and open systems agencies, can build upon a stable platform or the sharing of 11179 metadata items.